A San Diego teenager's remarkable recovery after a devastating skateboarding accident is inspiring his mother to do all she can to convince other skateboarders to wear helmets. Paige Hargis is spearheading what's called the "My Grey Matterz" campaign. The goal is to change the culture of skateboarding by educating skateboarders and their parents, and by partnering with professionals and other leaders in the skateboarding community. On September 19, 2013, Paige's son Alex was skateboarding in the street in front of his house when he fell backward and landed on his head. The then 13-year-old was not wearing a helmet. He was knocked unconscious and suffered multiple seizures. "The image of my son repeatedly slamming his head against the pavement in front of my house will be forever etched in my memory," Hargis told NBC 7 San Diego. "I felt completely terrified and helpless as the paramedics fought to save his life." Alex was rushed to Rady Children's Hospital, where doctors put him in a coma to reduce brain swelling. An MRI would eventually show his condition was worse than expected. Doctors told Alex's parents it was possible he could stay in a vegetative state forever. It was during that extremely difficult time that Hargis said she realized she had to do something about helmet use in the skateboarding culture. "I knew we had to do something to change this mindset, even as Alex lay in his hospital bed attached to a ventilator and an IV bank," Hargis said. Alex says right around the time of his accident, he had started to think it was "annoying" to wear a helmet. "He rarely saw his role models wearing protective gear because it was seen as uncool, or if you did wear it you aren't consider a 'legit' skater," his mom said. Accidents like Alex's are becoming all too common. San Diego County has seen a dramatic increase in head injuries among teenage skateboarders who are not wearing helmets. According to the County's Health and Human Service's trauma registry, there were 373 skateboarding injuries from 2013 to 2015. Eighty one percent of those skateboarders sustained a traumatic brain injury and only 9 percent were wearing a helmet. The highest rates are in beach side towns. Most are recreational riders who are on public streets, often riding downhill at high speeds. Skateboarders 16 to 18-years-old are significantly less likely to wear a helmet than other age groups. Alex was lucky. He did slowly begin to recover in the hospital. But because of his traumatic brain injury, he had to relearn everything, from how to eat to how to walk. "It was really frustrating to have to relearn all of my school work," Alex said. "For example, sometimes that meant I could do algebra but not subtraction." After 61 days of intense therapy, Alex finally got to go home. "My son's recovery has been nothing short of miraculous," Hargis said. "and even so it has been a challenging three years to get where we are today." Alex is a student at Torrey Pines High. Because he can't play contact sports anymore, he started rowing with the San Diego Rowing Club. He also now does school presentations around the county promoting helmet use. Meanwhile, his mom is working to build the My Grey Matterz campaign. A grant from the Trauma Research and Education Foundation (TREF) is helping her produce PSAs focused on educating teens. They should be ready late summer. She's also working on developing the website, which you see by clicking here. Another priority for the campaign is to convince professional skateboarders to embrace and help spread the message. On September 19th, 2013. 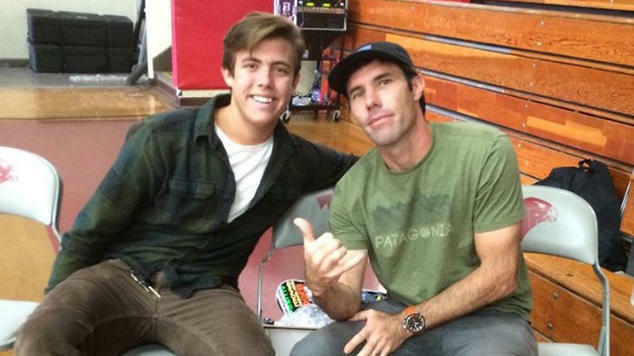 Alex was critically injured while skateboarding without a helmet. He suffered severe brain damage. This is the story of his journey to recovery and the importance of always wearing a helmet. World Cup Skateboarding Champion and XGames medalist Andy MacDonald is one pro skater who signed up to support the campaign. "It's been a long time coming, but I think that skateboarding is finally old enough and mature enough to get over its own image problems and start supporting a pro-helmet culture," MacDonald told NBC7. "It's not about making helmets cool. They are necessary, period. The only thing not cool is brain trauma," MacDonald said. Professional skater Andy MacDonald. He has been crowned as skateboarding’s World Champion for nine years in the World Cup Skateboarding Series and has competed in every X Games since its inception and owns 23 medals. Longtime skateboarder and industry leader Chris Conway is also lending his support to the cause. "I have seen far too many head injuries both in the professional and amateur worlds and it pains me to see injuries that could be avoided by simply wearing a helmet," Conway said. Alex Hargis said his accident taught him that a split second decision can change, or even end, your life. "Wearing a helmet may not look the coolest or feel the best, but is that really worth the risk of permanently affecting your life, or even ending it?" Hargis said. "Do you really want your mom to have to feed you and change your diapers for the rest of your life?"